After two visits to a local ENT doctor who performed two biopsies – both benign – and then a follow-up visit to her primary care doctor, Joy Wood was at a crossroads. For the past six months she’d been troubled by itchy skin and odd lumps in her neck. Even after two benign biopsies, her primary care doctor wouldn’t rule out cancer. Insistent that she could not possibly have cancer, Wood found herself at odds with a doctor who now refused to move forward until she could substantiate her case. “You need to prove to me that you don’t have cancer,” her doctor declared. Unyielding, Wood pushed for a blood test, convinced the results would put her in the clear. Wood’s doctor referred her to Duke Cancer Institute. The team ordered yet another biopsy. This time, having sampled a greater amount tissue, the results were conclusive – Wood had stage 2 B Hodgkin lymphoma. Hodgkin lymphoma is one of the most common and most treatable blood cancers. According to the American Cancer Society, Hodgkin lymphoma is a cancer that begins in white blood cells known as lymphocytes. Although Hodgkin lymphoma can start almost anywhere in the body, it most often starts in lymph nodes in the upper regions, chest, neck or under the arms. Early signs and symptoms can include lumps under the skin, which are actually enlarged lymph nodes, itching skin, fatigue and loss of appetite. When diagnosed, Hodgkin lymphoma is also classified in each stage as A or B. If a person has B symptoms, like Wood, it typically means the lymphoma is more advanced, and intensive treatment is often recommended. Wood has undergone chemotherapy, which most likely will be followed by radiation therapy. On Sept. 14, Wood, all smiles, powered through her last round of chemotherapy. Her fight isn’t over. In the months to come, Wood will most likely begin radiation treatments. 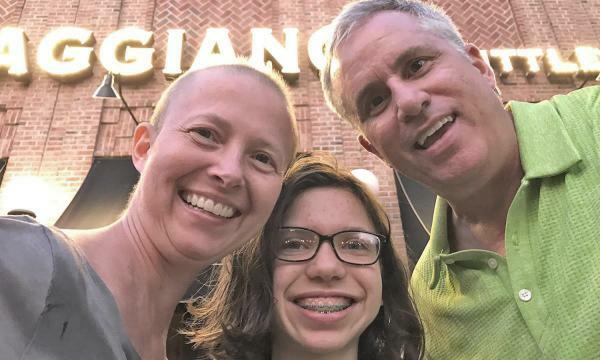 On her final day of chemotherapy, Wood celebrated, in part, by signing on to participate in this year’s Light The Night Walk, an annual event hosted by The Leukemia and Lymphoma Society. The society, which raises funds to support the fight against blood cancers, currently funds more than $1 million in blood cancer research grants at Duke. Wood has formed a team, inviting her family and friends to support the fight against blood cancers. The Light The Night Walk will be held Saturday, Oct. 28, at Booth Amphitheatre in Cary, North Carolina. Duke Cancer Institute team captains include: Danielle Brander, MD; and Duke Raleigh Hospital president and leukemia survivor David Zaas, MD, and his wife Aimee Zaas, MD. For more information or to register, visit Team Duke Cancer Institute. To join or donate to Joy Wood’s fundraising efforts, visit Team Joy.